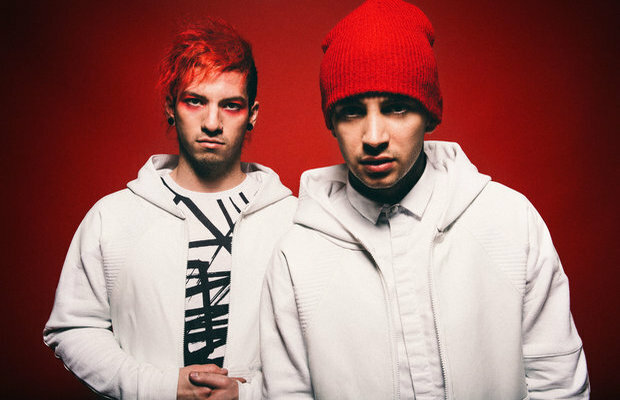 You might have noticed twenty one pilots’ new look that debuted with their number-one album Blurryface. Brandon Rike, the man behind the design, posted a seriously cool explanation of his process and the character of Blurryface on his personal blog. Rike describes a conversation with frontman Tyler Joseph in which he became familiar with Joseph’s ideas for the mysterious character. “He can either be represented as sad, angry, evil, or deceptive. He has a tendency to draw you in, but only to pull you down,” Rike writes. Coupled with the symbol are Rike’s new interpretations of the Twenty One Pilots logotype, as well as distinct symbols for the Skeleton Clique, Alien Josh, and Few Proud Emotional. As for the cover art, creating the look of Blurryface was no easy task. Rike has created an experience in the physical album to represent the dynamics of Blurryface. In the special packaging, the CD’s cover can be taken apart to represent the many layers of the character. “You may buy the album in the store that looks seemingly simple, but as you explore it, you soon find out how conflicted and complicated it all is,” says Rike. You can get your hands on a specially packaged copy of Blurryface here.